Maki Roll has been creating costumes and cosplaying for over 6 years. Her work covers several genres from comic books and video games to anime and each costume she makes is very detailed. She has recently branched out into the world of burlesque, which offers Maki another avenue of creative expression. She also takes some of her nerdy pleasures along with her and turns it into the sub-genre of Nerdlesque. Being a person of color has not stopped her from portraying any character she enjoys, regardless of their race. She does so with a conviction and passion that makes people look past those details. I was a big fan of anime and manga in high school and I had heard of anime conventions. When I finally convinced my mom to take me to one, I saw a bunch of awesome people dressed up and decided to look more into it. I was hooked. I’ve been cosplaying for about 6 years now. 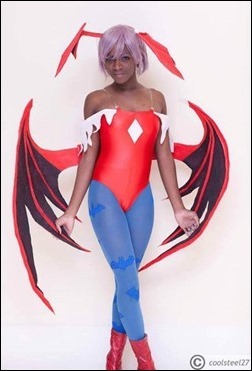 My first costume was Inuyasha (and thankfully there are no pictures). 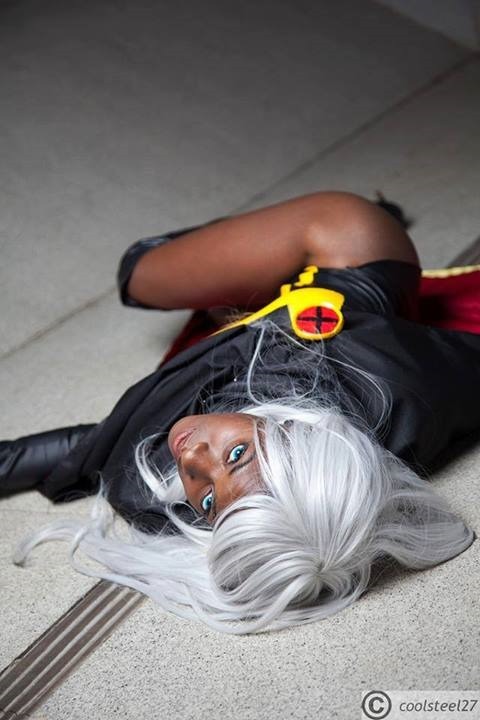 Probably my most recent Storm from X-Men Worlds Apart. I think every costume I make becomes my most satisfying one because seeing the progression in six years is really great on its own. Storm definitely. I also like characters with very strong personalities and who have a variety of poses. 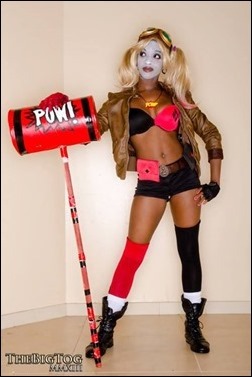 Harley Quinn definitely comes to mind. Did you grow up with comics, animation, and video games? I have a younger and older brother so video games and “boy” things were always around me. My older brother would pass his video game consoles down to my younger brother and I so we had everything; Sega Genesis, Nintendo and Super Nintendo, Nintendo 64. I was also a big fan of the Power Rangers. I didn’t really dive into American comics until about five years ago, but since then I have been reading anything that I can. What are some of your favorites video games, comics, & anime? The first game I ever sat and watched my older brother play was Resident Evil (when I was 8, mind you), so that series has a special place in my heart. I also am a big fan of Mortal Kombat, Fallout and Killzone. For anime it would have to be Cowboy Bebop, Outlaw Star and Gundam Wing. Comics; I’m really digging Saga right now, but I love Sin City, House of M and Hack/Slash. I’m really into indie publishers. You just recently started doing burlesque dancing. 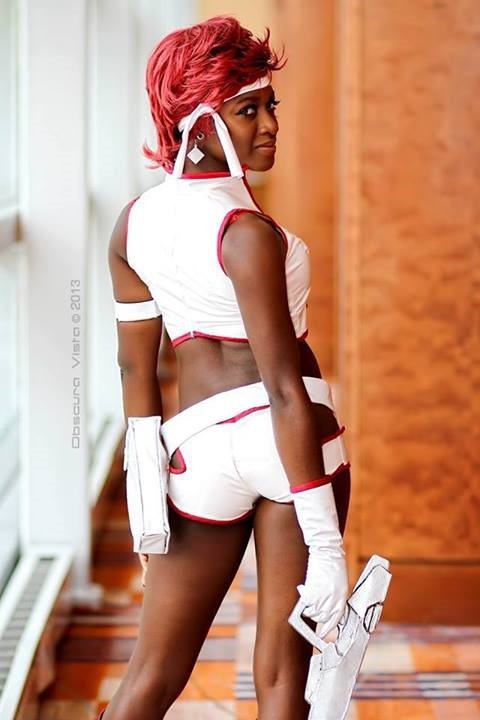 Do you incorporate any cosplay themes into your performances? Absolutely! Nerdlesque (nerdy burlesque) is its own subgenre within the burlesque community because it has gotten so big. I actually cosplayed Pikachu with my friend Polychrome Dreams and afterwards, added rhinestones to the costume and made a burlesque number out of it! 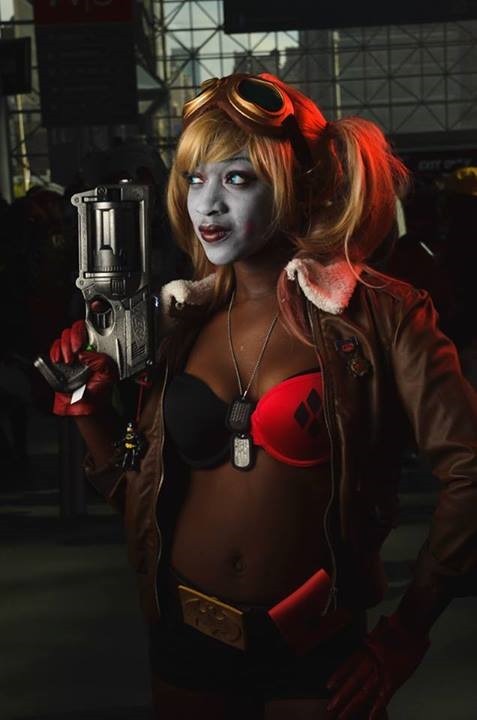 How did you find the transition going from cosplayer to burlesque dancer? It’s interchangeable I think. You take on a different persona in each hobby. 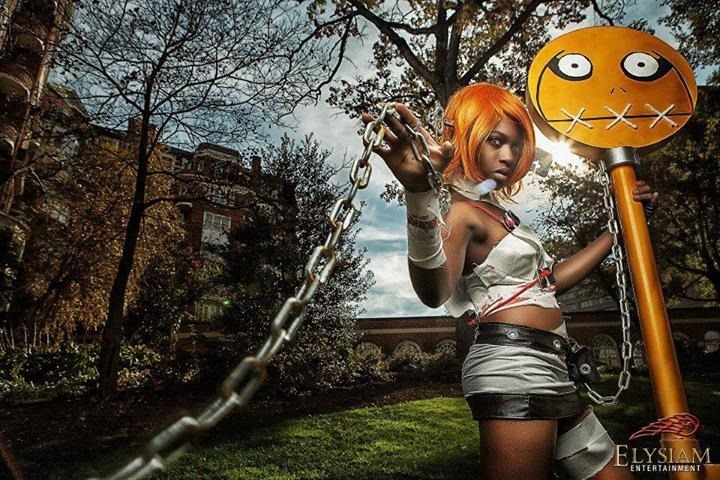 With cosplay, you’re creating a costume based on an already developed character. With burlesque, you kind of create your own character depending on what you want to convey in your act and you build your entire number, including props and costumes, around it. Since cosplaying is very interactive experience with fans, have you had any bad experiences with it? Not anything terribly upsetting. 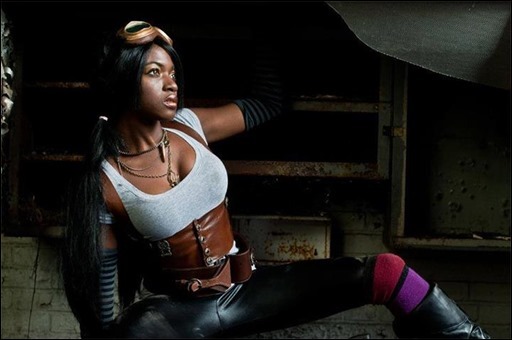 There is the typical “you’re a fake nerd girl” or “you’re black why are you cosplaying this non-black character) but I usually ignore it or comment very politely. People I’ve met in person are very polite. I’ve been very lucky thankfully, and I feel awful reading about all of the negative experiences cosplayers go through at conventions or online. Now that we have Caucasian characters in superhero films who are portrayed by persons of color, such as The Kingpin, Nick Fury, and the upcoming Electro, do you find that some people are still bothered when you portray a “white” character? How do you deal with that? Sometimes. As mentioned before, I’ll get really stupid comments about it. My favorite thing that happened is that a guy (who was black) came up to me at a convention and asked who I was cosplaying. Keep in mind I’m wearing full on alternating black and white with diamonds, blue contacts, face paint and blonde hair. I ask “who do you think I am”. He guesses Harley Quinn but then goes “I was thrown off because you’re black”. I didn’t even respond. I just walked away. I think it will continue to be a problem if people of color let it be a problem. It’s hard to not let it get to you, but as long as you are comfortable portraying the character and you have love for the character, there should be no problem. 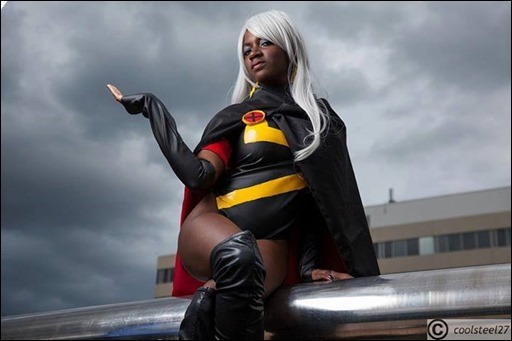 Hell; one of my favorite Storm cosplayers is a Caucasian female! 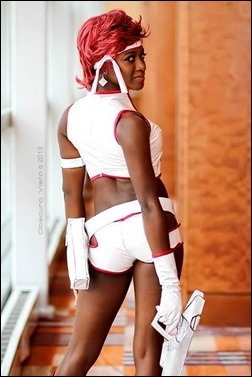 What do you enjoy the most about cosplaying? I would say making friends and having opportunities to meet great people. I’ve definitely met some of my best friends at conventions. It actually happened at New York Comic Con this year. My friends and I were all in costumes (we had two Rogues, a Marvel Girl and I was Catwoman). Someone asked to take our picture. We had been getting stopped all day so by now we just had a formation that we got into. My boyfriend goes “hey, isn’t that Seth Green”. 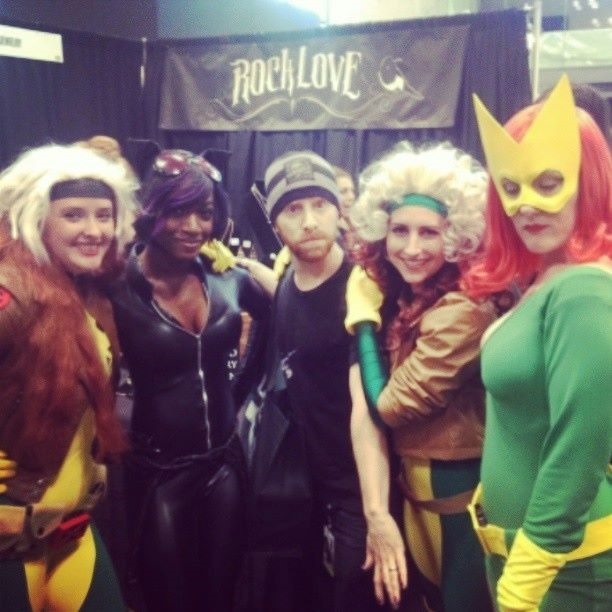 Seth Green asked us to take our picture. So of course we were freaking out over it. He was trying to keep himself incognito but he was sweet enough to let us take a picture with him before he left. That was definitely an experience I will never forget. A few days after the con he ended up putting this really derpy picture of us on his instagram. 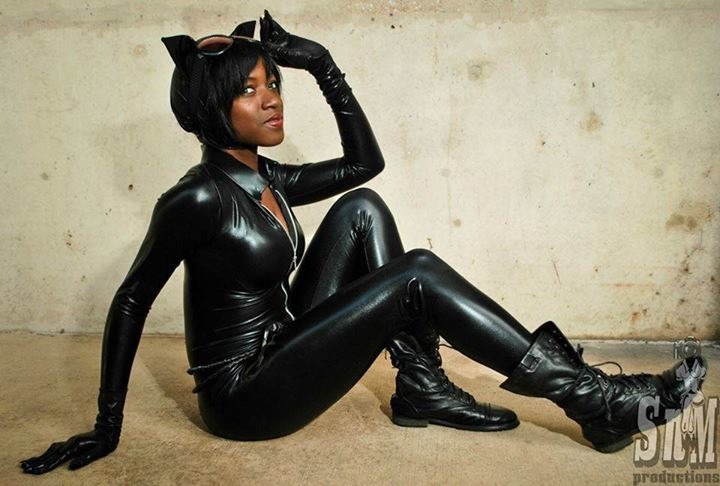 When I first got into cosplay, I was a huge fan of Bellechere! I also love Jay Justice, Freddie Nova, Eric Moran and Vampy. Not only are their costumes amazing, they are also extremely inspiring both in their craftsmanship and toward their fans. Yes definitely. It has become a lot more marketable, especially with “Heroes of Cosplay” airing. It kind of seems like a race to have the most fans or to extend 5 minutes of e-fame to 10 minutes. It used to bother me a lot, but now I really don’t care. Everything gets popular and with popularity comes change. For me it’s fun, but I would be lying if I said I didn’t accept opportunities I wouldn’t have normally gotten if not for cosplay. You attend both Anime Cons and Comic Cons, what do you find to be there difference between them and do you prefer one over the other? I think there is a definite difference between the two. I wouldn’t say Comic Cons are more mature, but there are certainly a lot more older people there, which is great. Don’t get me wrong, I absolutely love anime conventions, but in 2014 I have been scoping out a few more Comic Cons to go to! Cosplay is fun first. Don’t lose sight of that. Whatever you choose to do beyond that is your business but don’t make it into a rat race. Nothing! Everything happens for a reason, and I have evolved and met so many great people and done so many great things along the way. I wouldn’t change a thing. I’m actually teaming up with a local decor/LED company called CustomNightGlow to create Nidalee’s Headhunter skin from League of Legends. It’s going to be my second attempt at armor (first being my Black Rose costume) and we’re looking into new methods to make this happen. We’re gonna make that sucker glow~! I told myself I would stop cosplaying when I turned 21. Here I am at 23 still cosplaying. I don’t know when I’ll ever stop, but I’m always optimistic about the future. Thanks for the interview Maki and we look forward to seeing a lot more of your awesome work in the future! If you’d like to contact Maki Roll for convention appearances, modeling opportunities, or other work – you can do so here. Share your thoughts about Maki Roll in our comments section below!